Do I stink? Reek? Smell slightly like rotting fish? That’s the question you’re asking yourself, right? If you’re new here, what you’re reading at this moment is a conclusion to my homemade deodorant experiment. For details on how it came to be, the different recipe options, and how to do it yourself, go … go now, young ones … and read. I will wait. I am reporting early for a reason. That’s not to say there weren’t a few issues at the beginning, but it’s reached the point where I can confidently say that I will, forever, be a homemade deodorant convert. Day 1: Love the smell of this stuff. I want to lick my armpit. Maybe later tonight, when Fiance’s not around. It’s been a little itchy, but nothing major. After all, my underarms itched with store-bought deodorant sometimes, too. Day 2: Holy mother of cheese. I woke up at 3:00 a.m. last night and felt like someone lit a burrito on fire in my armpit. Fell back asleep after writhing in pain for 20 minutes. Pain is gone now. Maybe it has something to do with applying the deodorant right after shaving? I’d give up now, but there’s been no sweating and no off-putting odors. Continue, I will. Day 3: Smarter this time, waiting until an hour after the shower to apply the deodorant. Now I know it takes me at least an hour to start stinking. Good to know, if I’m ever stranded on an island with Jack and Sawyer. Wonder if anyone else has ever thought about how much those Lost people must’ve reeked. Please, Hurley, stop raising your arm. So far today no itch, no stink, but a little bit of extra moisture. Pretty proud of my pits. Day 5: Haven’t showered for 36 hours. Wish I could say it had something to do with the deodorant experiment, but I’m just lazy. Felt like I should reapply a few hours ago, even though it wasn’t stinky. Just a bit of moisture, but nothing to change shirts about. Maybe I just won’t shower anymore. Talk about going green. Day 7: The slight itching has stopped completely, with no return of the first night’s fiery pain of hell. Seems like maybe my body has adapted, as well, because I haven’t felt sweaty at all for a day, either. And, of course, I smell like ylang-ylang and nothing more. At least, that’s what I think. I’m going to ask some friends to smell-test me later, just in case I’ve gotten used to a funk. Day 8: Friends reluctantly sniffed in the vicinity of my armpits. Promised they smelled nothing untoward and then kicked me out of the car for being weird. Guess I’m going to need new friends. Good news is, I’m done keeping this journal, because this stuff works. And I love it. This might be TMI, but it has to be said in order for me to get my point across. So. Sorry. Read it fast, like ripping off a band-aid. I don’t know if anyone else will experience this unexpected – good – side effect, but I did. And now my pits and I are much better friends, on a superficial level. Hi all! I’ve been using a version of this deodorant for three months. I am a convert and will not look back. It works better for me than commercial aluminum-based deodorants ever did. My armpits got a little red and raw when I used equal parts coconut, cornstarch, and baking soda. This had to be due to the abrasive and caustic nature of baking soda, so I upped the amount of coconut oil to where now itâ€™s 3 parts coconut oil (or more!) to 1 part baking soda and 1 part cornstarch, and my pits are very happy. So play with the amounts; coconut oil by itself is supposed to have mild anti-bacterial properties. Some people even use it straight as a deodorant. Iâ€™ve used jojoba with a few drops of EOs, and it worked, too, although not as long as this concoction. Do you think you’d like to try your own homemade deodorant? Or are you married to the brand you use? Or, conversely, do you USE your own homemade deodorant – and what do you think of it? If there are enough people willing to give it an honest try, I’ll write a post again in the next three weeks or so to chronicle your personal experience – featuring your comments here. BTW, if you want to switch to an all natural deodorant but don’t want to make it yourself, this might be just the solution for you! My armpits and I would benefit from being better friends superficially. I recently made my own deodorant and then stuck it in the cupboard for a couple weeks. I was reluctant to try it. I was afraid it wouldn’t work. Finally, about 3 1/2 weeks ago, I pulled it out and decided to try it. I LOVE it! I have had a hard time finding “natural” deodorants that work for me, but this does! Really, it surprised me how well it works. In fact my husband and I were recently in Vegas for a business trip and I wore it on a day when the temp was in the high 90’s and when I was walking a good part of the day-it was an active day. Come evening-no stink! I am a convert and plan to make my own deodorant from now on! But, it did sting like crazy when I used it the morning after waxing my pits-OUCH! Other than that, no discomfort. Awesome. I LOVE how you really seriously put the stuff to the test with a day in hot Vegas. I’ve taken a few long walks since using it, but it doesn’t get terribly hot and sweaty in Colorado, so I wasn’t sure how it would stand up to actual stink-inducing conditions. You definitely give me even more confidence! I was just going to wait until we ran out of our current deodorant, but this post has inspired me to start now! I will give my feedback once we try it out : ). Like I said earlier Thom’s leaves me all stinkified so I end up caving (caving = aluminium) and I don’t want to cave anymore…but that cautionary comment scared the crap out of me! Six weeks in all of a sudden? AAA! I need more information! You are the number-one top-of-the-heap crunchy guinea-pig in the whole entire universe for testing this stuff for us… thank you! I forget (and am too lazy to read the other post right now), what’s the shelf-life on this miracle de-stinker? I’ve recently discovered your blog through Stumbleupon (yet another reason to love it! ), and I’ve been reading for a few days now and I am totally and completely, officially, addicted. Just over a week ago I picked up my whole life and moved it from the US to France because I wanted a change in scenery and a change to a healthier lifestyle, and I think with the fine quality ingredients I can get here (for next to nothing!! ), along with your amazing recipes and insight, I am well on my way! Very seldom do I use deodorant or antiperspirant. I’m not foul or anything like that, I just tend to forget about it and no one’s ever complained. In fact, my boyfriend often tells me how much he loves my natural aroma. I do, on occasion, wear a smear of his Old Spice deodorant because I like the scent and it turns my man on. 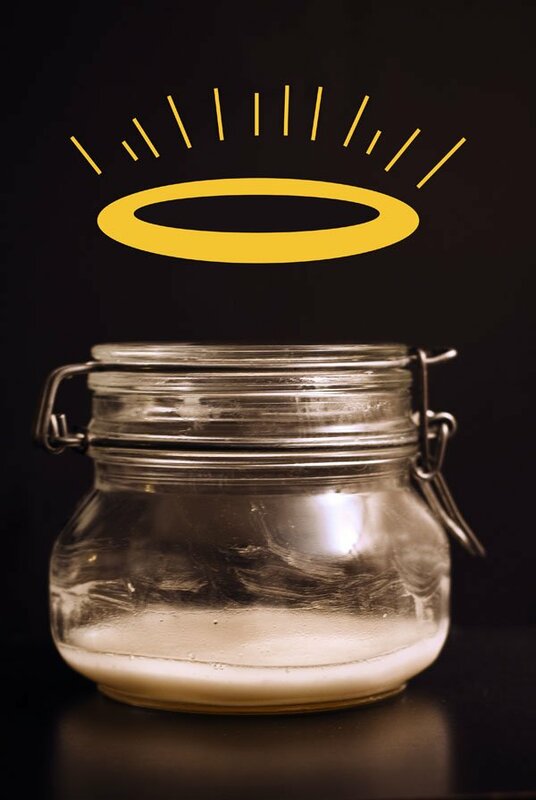 I -will- try your homemade deodorant recipe, however, because I also make homemade bath and body products, and something like this could be an awesome addition. Am I seriously going to have to change “Food on Your Face Friday” to Food on Your Pits Friday”. This is one thing my hubby and I have struggled over. Natural deodorant does not work on active tweens. I will give it at try next week. Daughter is performing all day tomorrow so we are taking a break. It will be very interesting to see if this one works. What do you think about adding tea tree oil to the mix? And for those curious about “Food on Your Face Friday”, check out what happened when my kids put Bettys pimple zappers to the test. I made homemade deodorant a few months ago, before summer started. I used the exact recipe you used, with equal parts baking soda and cornstarch. Although it wasn’t painful to apply (at least for me), about a week into using it, my underarms started to get a light rash, and then the skin started to peel, like your skin does after a sunburn. I’m thinking that I need to use less baking soda in my next batch. (As it was, I went back to using a natural deodorant in the meantime, but I’m working my way through a bunch of homemade DIY beauty and cleaning products, so I want to give homemade deodorant another try). Baking soda is an abrasive cleaning product so it would make sense that it can aggravate the sensitive skin in your underarm areas. Furthermore, as far as the stinkage vs. sweating… sweating is natural. There’s a reason your body does it. So I personally don’t have a problem with sweating a little bit. I guess as along as you’re resigned to the fact that you’re not going to have the Sahara in your armpits anymore (like you would if you were using an aluminum-fortified anti-perspirant), then you’re not going to be disappointed with a little dampness. i have been making my own deodorant for the last year (same recipe) and i will NEVER go back!!! it lasts the whole day and i never have to reapply..my husband is a runner and even after a long run that deo does the job! LOVE to hear these stories! I’m amazed at how well this works – even for people like your husband (runners … sweaters). It makes me wonder why they ever started putting aluminum in deodorant in the first place. “Better living through chemistry” really got us into one fine mess. Hi…I’ve been lurking around here for a couple of weeks and am finally getting around to commenting. I recently made my own deodorant and have been loving it. I was super paranoid at first…and I went to a concert on the first night I was trying it so the whole I time I was thinking, “Probably not a good idea…” But…it works great! And I am one that had serious sweating issues…big sweat circles under my arms all through high school and college. The only thing is I miss the fresh scent of the store bought kind. I am looking for that perfect essential oil to add in, but haven’t found the scent I like yet. Anyway, a very long comment all to say–try it, it works! Maybe try lemongrass essential oil? It’s nice and fresh, but without the sharp citrus smell of lemon. Thanks for unlurking! It’s soooo nice to see you here! You could try cedar or sandalwood for bonus masculinity points. Tea Tree oil has naturally antibiotic properties and it has a very earthy scent that would be appropriate for men. In fact, I use it more sparingly than others because it has such a masculine smell. Mint might work well too. One way to cheat this is to look at what the commercial products are bragging they use for scents on their products. A quick look at my boyfriend’s products…they brag of lavender, rosemary, agar wood, tonka bean, amber, and vanilla so these are all scents you should be able to get away with and smell dudely. You might consider Frankincense essential oil. It is used in Asia to keep skin healthy, it has a spicy, lemony and conifer or piney scent. Not at all bad and quite masculine! This is awesome, I will absolutely try it! I used to make one myself out of beeswax, oil, and essential oils of lavender, clary sage, and lemon–worked GREAT. That’s a good oil blend–I could go twice as long without stinkage using that as I ever could with any other “natural” deodorant I’d ever tried. Also, FWIW–when I made the switch from aluminum to natural, my pits went through this GODAWAFULSTINKAGE period of about a week, which pretty much went away once I got through it. I mean, I still need deodorant, but for a few days there it was beyond gross. I wonder if there’s a detox/adjustment period we need to go through? Yeah, I’ve heard SO many stories about people having a couple of days of really raunchy “detox” when they switched to natural deodorant. In fact, it’s part of the reason why I never stuck with the store-bought “natural” stuff. I’d use it for a day or two and think, “This doesn’t work AT ALL.” So I’d give up and toss it after a while. yes i use my own home made deodrant. i first use a perfume oil & then dust a mixture 50/50 corn starch & baking soda. works for me. I’ve been using homemade deodorant for almost a year and would never go back. I am the sweatiest person in the world – hands, feet, underarms, head – everything on me sweats and I’m amazed that it works so well. I’m in the camp of really, really stinking when I first started using it, too. Because my mother had breast cancer and my grandmother had Alzheimer’s I was determined to stink it out. There were several days where I stood as far away from my coworkers as politely possible because I could smell myself and knew if I got too close they would wonder why I was no longer bathing. Thankfully that phase ended before I got fired or lost any friends. I also clean my armpits twice a day with a homemade wash of chamomile tea and vitamin E oil because it smells good and soothes any itchies I might get when I am lax with my measuring and use too much baking soda. An added benefit it that there are no more yellow stains on my clothing from the nasty stuff in antiperspirants. Even if it is hot and humid and I do sweat a little, it never smells bad anymore. Thanks for the fantastic comment! I, too, am amazed at how well it works. Especially given my (and everyone else’s innate aversion to it at first). I love the chamomile tea/vitamin E idea. Writing it down so I don’t forget. Should I add some shea butter or something? I want to use it but it is nearly impossible in this crumbly form! Help! double or triple your coconut oil. IT WORKS. I cut the baking powder in half because I have sensitive skin, and added lavender and rosemary essential oil. Also, I didn’t melt the coconut oil– just mashed it all up with a spoon. Natural deodorants never cut it for this girl, but I refused to buy aluminum-filled pore-cloggers either. Well, I’ve been using this for a couple of weeks: no stink and no rash. And it smells awesome. Hallelujah. I use milk of magnesia and my pits are happier than they’ve ever been. 🙂 Just buy a blue Phillips bottle, put some in my palm in the morning, and slap it in my pits. Takes a few seconds to dry but works great and super easy. I use milk of magnesia too. I’ve been thinking of adding an essential oil to it, just to have a nice scent. But it works great! I have been looking into trying this and came to this post via the No Poo post. I was mentioning it to my partner about the use of baking soda for personal hygiene and he told me something I didn’t know. Baking soda has aluminum in it. I have heard that aluminum is what makes the deodorant work but it is really not good for you! Has anyone used non-aluminum Baking soda for this? If so does it work? i don’t know if anyone else has responded to the aluminum issue of baking soda, but Bob’s Red Mill has an aluminum-free baking soda, that’s what i use. it’s great! Thank you! I forgot to come back and comment after I found aluminum free stuff. I agree with you Kari, I find that Bob’s red mill works wonderfully both under arms and hair! This of course was after I accidentally grabbed baking powder… oh man was that ever a disaster, my hair could have stood up and walked on it’s own after one wash. I was so confused as to why it wasn’t working until my guy noticed it was fizzing and informed me it was baking powder. Sage is supposed to be a good essential oil, so that could be manly. Or no scent? Bay or bay laurel are very manly. I’ve used baking soda, just dusted lightly in the pits, for decades. Like 3 decades. When I first read in the 80s that aluminum was bad for you and that it was in antiperspirant, I tried health food store varieties. Yes they had them back then. None worked for me, as I’ve always had a kind of strong odor. But baking soda by itself does the trick! I’ve mixed it with corn starch in the past, but now all corn is genetically modified, much of it to have Bt pesticide in every CELL, so I would not put Bt corn under my arms! Plus, RoundUp, the herbicide that all corn (save organic) is doused in, is a systemic pesticide too, of course who knows if some nano-bits would survive the processing, but I’m not taking any chances. As to baking soda, I’ve read that it is alkalizing and that cancer doesn’t thrive in an alkaline environment. Maybe that is just theory, but it made me feel better. It is also said to be a strong detoxifier, and I’ve read recommendations to soak in a tub with baking soda in it, along with salt. I may try the cream, may just stick to my original baking soda powder and add arrowroot powder. Thanks for this great crunchy resource. 🙂 I don’t think I would ever have been brave enough to try homemade deodorant if you hadn’t documented your experiences so thoroughly. So, I’ve just jumped (belatedly) on the bandwagon! It works fine and dandy, and the only issue I’ve had is a little bit of itchiness from the baking soda. . .Which is awesome, because the Tom’s solids I’ve tried just haven’t worked, and all of the crystal/salt liquid ones I’ve tried have left my pits high, dry, and painful. But. . .I wonder if anyone else has had this problem: My coconut oil gets WAY too melty to apply easily. I don’t know, maybe my armpits are just hotter than the average armpit? But when I try to put it on with my recycled Tom’s tube, it gets all wet and wild and dribbles all over the place. I tried sticking it in the fridge and applying it straight out of there, but then I couldn’t roll it up because it was too hard. Substitute some of the coconut oil for shea butter- it’ll make a firmer mixture once it cools 🙂 I don’t know if it’ll work in a tube, though, most people just leave it in a jar and apply with their fingers. If you want it in a tube you might have to use one of the beeswax recipes. I know this is a deodorant and not a hair reducer but you have to be careful with which essential oils you use. I took an aromatherapy soap making class and learned that citrus essential oils are hair growers. So we were taught to warn recipients of our soaps not to use those with grapefruit, for example, on their faces! Hi, I just stumbled upon your blog through a pin on pinterest. I am highly allergic to regular deodorants. The stuff literally burns my skin and gives me what would be compared to a second degree burn. I have tried many au natural deodorants with varying degrees of success. I have not tried (as of yet) the recipe you present but may give it a shot. What I currently use is Aveeno Baby fragrance free soothing relief diaper rash cream and that works spledidly. I just offer that as an alternative if people don’t wish to deal with all the messy mixing and storage of the other. 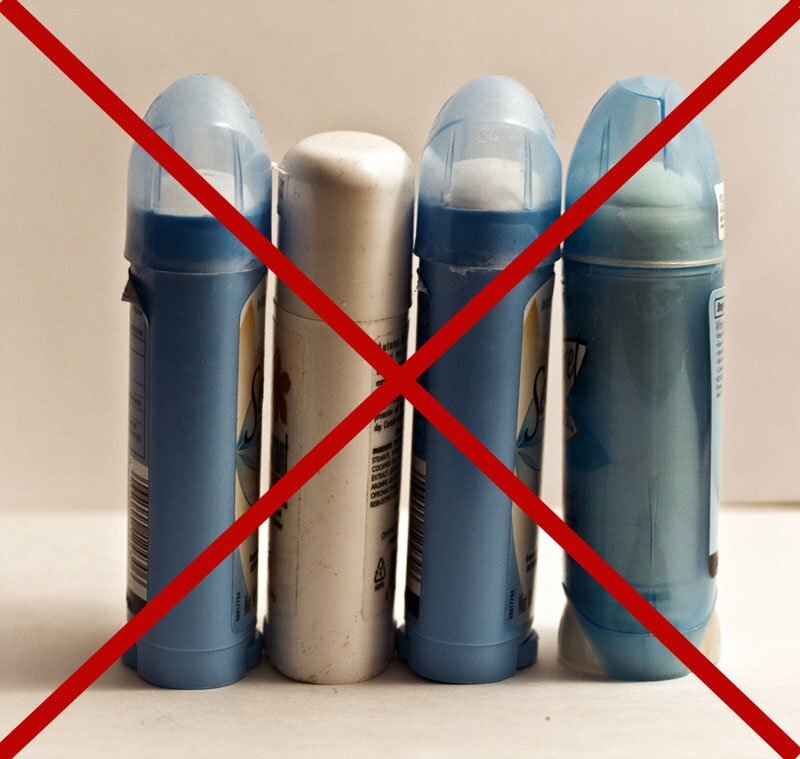 I haven’t started my own homemade deodorant yet (I feel guilty not using all of the natural deodorant I have, although it’s not terribly effective), but here’s another reason not to use aluminum anti-perspirant–aluminum smells worse than BO. My friends tell me “normal” people can’t smell the aluminum in deodorant, but for us super-sniffers it’s just abominable. So, however much you think you might stink using the homemade stuff, you will still smell better than with the carcinogenic aluminum variety. My only question is: how does this do with the “little black dress” test? I really don’t want white crustiness around the arms of my clothes, especially sleeveless tops and dresses. That’s the main reason I’ve been using a particular commercial deodorant, because it doesn’t leave residue. I have not had any problems with this recipe, as long as I let it soak into my skin first. I usually try to do my makeup or fix my hair in between applying my deodorant and getting dressed so I don’t accidentally get it on my clothes. But once it’s soaked in I never know it’s there, I’ve just got smooth, pleasant-smelling pits. Great tip – much appreciated! Like the idea but allergic to coconut AND chamomile. any suggestions for substitution of coconut oil and chamomile? I love this deodorant! I have always had very bad sweat problems, so much so that I would never wear t-shirts or any shirt that clung too close to my underarm because I would soak it through. Even in the winter when the rest of my body was freezing my armpits would have these huge wet rings under them (SO embarassing!). I have tried every commercial deodorant/antiperspirant I could get my hands on. I was up to using deodorant with TWENTY-FIVE percent aluminium, even though both Alzheimers and breast cancer run in my family. And I still soaked through shirts. I was a little crazy, I think. The first day I could tell a difference. I sweat almost none at all. I stunk to high heaven after 12 hours, but by then it was shower time anyway. I also had some issues with itching and redness, and the skin under my arms peeled after about a week. I almost gave up, but decided to try and push through. That was 3 weeks ago, now I hardly stink at all, (just a little on days when it’s 100 degrees outside). I do still sweat a little (again, it’s 100 degrees outside here), but nothing as ridiculous or unmanageable as before. And I am only about 3/4 of the way through my batch. The only thing I will change is using arrowroot powder next time instead of cornstarch as my pits still get red and itchy sometimes (usually only when I apply immediately after shaving). I will never ever go back to store-bought deodorant. Ever. I am a crunchy-convert. I was a big Secret fan until I spent a night crying in bed with cold washcloths under my arms. Seeing your blue tubes of pain all lined up made me itch in sympathy. I finally found a roll on that was great. NIVEA Sensitive I have used it for years and never a problem. The only drawback is that its German and they don’t sell it in the stores here in the states. So I have to order it from GermanDeli.com at nearly $9 a bottle, when it is in stock. It never occured to me that you could make your own and control what gos in it. I am really going to have to try this. I was very scared to try this out after reading of the bad reactions out there. I tried this over some time off work, buying it from someone else so I could see what it’s supposed to be like. I mixed a version with coconut oil, shea butter, baking soda, cornstarch, and eucalyptus oil. My underarms smell way better than they ever did with anti-perspirant, and no shaving bumps or irritation. I’m never going back! Thank you Crunchy Betty! Hi! Last week, with great excitement, I finally procured me some coconut oil. I whipped up a batch of this homemade deodorant on Thursday, but noticed too late that I’d used baking powder instead of baking soda. I tried a bit as soon as I’d dried off from my shower. It stung annoyingly for maybe 15 minutes, and I got nervous about using it again, but Saturday morning I tried it and it didn’t sting. I’m going to keep using it for a while, but just in case, is there anything harmful about the powder vs the soda? Oros — Baking powder is not the same as baking soda. Some formulations of BP contain aluminum. The others … well, they just ain’t baking soda. Make the recipe again per the directions and move on. Better to waste a little money and time than just hope your inadvertent experiment will work out okay. To those of you who are using essential oils (EOs) in your deodorant or any other body care product — please remember that “natural” does not mean “safe”. Some EOs are skin irritants, photosensitizers, or allergens even in small doses. Betty used 9 drops of EOs in her original deodorant recipe. In the 5 Tablespoons of liquid (the coconut oil), these 9 drops makes a total EO concentration of about 0.6%. That’s probably pretty reasonable, but I wouldn’t add much more EO than this, especially if you are not especially knowledgeable about EOs. Be cautious about the 3 EOs she chose — ylang-ylang, tea tree oil, and the citrus oils (lemon, grapefruit, orange, etc.) — especially if you will be applying them to tender or irritated skin. These EOs will probably be fine for most people, but they do have a higher chance of causing irritation, photo-sensitivity, or an allergic reaction than other EOs. generally regarded as one of the safest EOs for general use. Betty: I love this recipe and IT TOTES WORKS! I used lemongrass oil and my pits smell like lemon cheesecake. No rash for me, no burning, just luscious lemon cheesecake pits and constant hunger pains. I actually stopped wearing deodorant because of all the nasties in it. I didn’t stink unless it got hot or something and even then it wasn’t too horrible. My husband is another story. Soap sometimes does not get the armpit stinkiness completely so I started making him use baking soda in the shower and then leave it on. I have been looking for a way to put on baking soda easily and this is so perfect! I made some right away and I love it. Our family traveled to Thailand 1.5 years ago. We went to a Natural Stuff store and found these crazy looking crystals. The store owner swore by them, said they were made from oil of citrus fruits. My wife and I have been using the same crystal since then and it looks virtually unchanged in size. Zero itch, zero stink. I’ll never use anything else. I’ll never need to, at this rate, that one crystal will last for the rest of our lives. I’m late to the party but I’ve found that if I apply pure coconut oil to my armpits before I put the deodorant on (mine has shea butter and clay powder as well as baking soda/cornstarch/coconut) it prevents the stinginess, even right after shaving. I think it provides a barrier between the open pores and the baking soda. I am experimenting now with adding activated charcoal to my mix, which is pretty much the basic mix here that I am a convert to. I figure, if it absorbs toxins, why not pit toxins. So far it turns my skin a little grey, but it’s winter (i.e long sleeve season). Is anyone here an athlete, and has tried this? How did it fan out? Did you majorly stink after a work out? Oh and when I mean athlete, your workouts are on the level of if you try P90X or Insanity and you think, hey this reminds you of just 1/2 of your daily training work out if not less. Personally I wouldn’t mind trying it, though I really do not like to stink esp. of bad cooked chicken w/onions. My armpits set on fire and then peel if I use conventional deodorants for more than about a week in a row. Which means I have spent most of my adult only being able to use them now and again on very special occasions! That was until I found Lush deodorants. Like the homemade recipes, they seem to rely on various powders and mild essential oils. They work well for me and don’t give me the pits of Hades feeling. I have been reading the uses of coconut oil and well…I now use as my facial moisturizer, hot oil treatment mask for hair, cuticle oil and yes…deodorant! I melted the coconut oil and poured into an empty deodorant container and let it set in the fridge til it was solid and I absolutely love it!! Hi, I was wondering if one could use Parachute Coconut oil in this recipe. In fact I did but it seemed the paste became dry very fast as in oil didn’t blend well. I want to try the other recipe with shea butter and see if it works better. 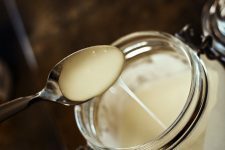 This homemade deodorant business really is The Best! Made a small batch for myself and my man before Christmas and will never go back to store bought again! Am really quite amazed how well this works; even after a super sweaty workout there is no odour whatsoever. Wow – love it! I packed mine into a deodorant dispenser and he prefers just applying it with his fingers. I’m terrified to try this because I have a…rather serious…sweat problem…like seriously, even in the freaking winter, by fingers will be blue from the cold but my armpits think it’s the middle of summer. However, I’m going to go with your “just run out” philosophy and…just run out. My d-o is almost done anyway, so why not. Oh my word, I never foresaw myself being this crunchy, but the other comments on here are giving me hope that this might actually work. Fingers crossed and thanks for the recipe! I made this recipe and have been using the deodorant to fantastic results for three weeks. This past weekend I was visiting my brother out of town and brought (and used) my old Dove clinical because I don’t have a travel ready container for my homemade deodorant. Today, three days later, I am noticing a bump under the skin of each armpit. I am wondering if anyone else has gone through this experience. I think it may be a clogged pore from the Dove. I’m hoping it will subside once my homemade deodorant takes over. Does anyone know if the coconut oil leaves an oily spot on your clothes? this is my first day of using diy deo. i use equal parts of BS and cornstarch then mix them and directly apply them to my pits after a bath. well i sweat a lot and i think my pits are still adjusting because goodness they cried but NO SMELL AT ALL which is FAB but one thing i noticed when i wiped the sweat away with a clean towel, a faint yellow stain came away. I wonder if that was built up deodorant…?? I fell in love with a concoction of this nature about two years ago! Went through the general itch week and noticed a difference right away, being that this stuff worked! I try to be a “natural” as possible and stay with organic products as much as possible, stumble across this company that makes this that is how I tried it. Realized this stuff can’t be difficult to make and researched put together what worked for me and I love it. Just made up a batch this morning and was cruising the web and came across your article and it really made me giggle. Love the journal 😉 great job sharing your concerns and wanting to be greener and finding a solution. My only advice, if you will, the combo is the key reason this stuff works on deodorizing and killing bacteria (that’s why we smell, that funky bacteria, making our excreted waste ((by way of sweating)) a happening buffet for the bacteria to thrive in) ;(0.o); But Baking Soda being a natural deodorizer is awesome, the coconut oil is a moisturizer and antibacterial, it’s nature taking care, naturally. I could never go back to the other toxic stuff! 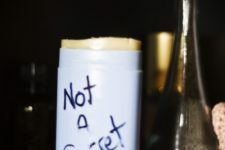 You can make it at your desired consistency the results for smelling like you haven’t been sweating bullets is still the same, but that is imo, I have made batches of all consistencies and the results were still as I desired, not to smell like I was sweating. Plus it is easy to make stores forever and I can personalize my scents to my liking. No it does not leave stains because the oils used can be washed out in a warm to hot cycle wash. No telling what filler is used to bind the other types of commercial deodorants. If you find you are chaffing or getting a rash from the residue from the baking soda and this is bc it can be a bit abrasive, hang with this organic natural way to deodorize, just add a dab more coconut oil under your arms. I keep a small jar in my bathroom right next to my deodorant jar for days just like the above mentioned. Happy DIY’ing Crunchy Betty!! Loved your article 😉 Thanks for sharing with us your experience, glad to know I wasn’t alone, lol! I am definitely going to try this. 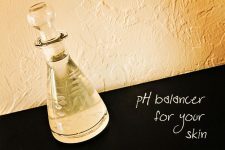 Just FYI that baking soda can be alkaline (pH 7) compared to the pH of the skin (pH appx 5.5). This may be why your arm pits were on fire the first night- could have been a chemical burn. I would say to anyone who is going to try this, to reduce the amount of baking soda if you have sensitive skin. My body is very sensitive to pH, so I am going to try this with less baking soda and more coconut oil. I have also heard of using just cornstarch in place of baking soda. My friend gave me this recipe: coconut oil, arrow root, cornstarch, favorite essential oil (can’t remember the amounts) so if you think the baking soda will both your skin or give you a chemical rash, this may be helpful! I think this is great, but just remember baking soda IS a chemical. I can’t wait to slowly rid my medicine cabinet of awful plastic tubes!